In stark contrast to the rest of the world’s advanced nations, the United States is growing at a record rate and, according to census projections, will be home to four hundred million Americans by 2050. This projected rise in population is the strongest indicator of our long-term economic strength, Joel Kotkin believes, and will make us more diverse and more competitive than any nation on earth. Drawing on prodigious research, firsthand reportage, and historical analysis, TheNext Hundred Million reveals how this unprecedented growth will take physical shape and change the face of America. The majority of additional hundred million Americans will find their homes in suburbia, though the suburbs of tomorrow will not resemble the Levittowns of the 1950s or the sprawling exurbs of the late twentieth century. The suburbs of the twenty-first century will be less reliant on major cities for jobs and other amenities and, as a result, more energy efficient. Suburbs will also be the melting pots of the future as more and more immigrants opt for dispersed living over crowded inner cities and the majority in the United States becomes nonwhite by 2050. The Next Hundred Million provides a vivid snapshot of America in 2050 by focusing not on power brokers, policy disputes, or abstract trends, but rather on the evolution of the more intimate units of American society—families, towns, neighborhoods, industries. It is upon the success or failure of these communities, Kotkin argues, that the American future rests. In The Next Hundred Million: America in 2050, the urban scholar Joel Kotkin, suggests that the diversity that may once have seemed unique to New York and other gateway cities for immigrants will be mirrored all over America, and that the nation’s “demographic vitality” — driven by birthrates higher than in developed but aging European and Asian counterparts and by a continuing influx of immigrants — will make it not only bigger but also better when the population passes 400 million before mid-century. Given the viral finger-pointing and hand-wringing over what’s seen as America’s decline these days, Mr. Kotkin’s book provides a timely and welcome — if sometimes Panglossian — antidote. He builds his case for the prevalence of American exceptionalism on the nation’s adaptability, ingenuity, vast land and other resources and religiosity (and also on a less convincing argument that the country has rebounded before). Joel Kotkin, a distinguished presidential fellow in urban futures at Chapman University in Orange County, California, and an adjunct fellow with the London-based Legatum Institute, has a track record of writing books and articles that are concise, intelligent, and backed by measurable data. The Next Hundred Million is no exception. The sprawl will get smarter, Kotkin writes, with fuel efficient cars and better planned neighbourhoods, but it’s pie in the sky to assume that Americans will turn away from the automobile. Barely 2 per cent of the U.S. uses mass transit on a daily basis. People also want to live close to work, and increasingly jobs are in the suburbs. According to one study Kotkin cites, only about one in five jobs is located within 5 kilometres of the city centre. Kotkin also describes, somewhat less convincingly, the coming decades as the dawn of post-ethnic America, a “race of races.” Some time around 2050 non-Hispanic whites will become a minority in the U.S., but the trend will be to blended ethnicities, he writes. In California and Nevada, mixed marriage rates are now at 13 per cent. That’s likely to rise, he argues, because polls show the millennial generation approve overwhelmingly of mixed dating. It can all seem a tad too optimistic. Kotkin admits that Americans are unlikely to change their environmentally foolish suburban lifestyles, yet somehow that will be managed by “smarter sprawl.” A country with centuries of racial conflict will make a smooth transition to being a race of races. The birth rate will remain high because America is more religious than other nations. The financial collapse of 2008 will be overcome and “new investment vehicles will emerge.” Is this more than American triumphalism? We won’t know for another 40 years. But when it comes to the future, the field tends to be dominated by those who preach doom and gloom. Kotkin provides a well-argued, well-researched and refreshingly calm perspective. LAMENTING its own decline has long been an American weakness, the nervous flip-side of being a country so apparently blessed. From preachers warning the earliest colonists that God was angry with them to Jimmy Carter’s doom-laden “malaise” speech of 1979, the fear that America’s best days might be behind it has never been too far from the surface. More recently, the worst recession since the 1930s and the relentless rise of China have precipitated a particularly bad case of funk. The astonishing outpouring of adulation for Barack Obama was one result of it; the longing for hope and change a symptom of deep-seated anxieties. Those given to such declinism may derive a little comfort from Joel Kotkin’s latest book, The Next Hundred Million: America in 2050. Mr Kotkin, a California-based urbanologist, has produced a volume which ranges from demography to city design to economics to ethnicity. Think back to 1967. The job you have today may not even have existed. The Internet, and all the jobs that have come with it, were decades away. The Detroit automakers were dominant. Quality of life was different, too: The median household income was an inflation-adjusted $40,261, compared with $50,303 in 2008. There were also a hundred million fewer of us; 1967 was the year the U.S. population hit 200 million. We passed the 300 million mark in 2006, and by 2050, there will very likely be more than 400 million Americans. The lifestyle of the average American may change just as much from 2010 to 2050 as it did from 1967 to 2006. The economy will especially undergo change. Joel Kotkin, distinguished presidential fellow in urban futures at Chapman University, has spent a lot of time thinking about exactly what those changes might look like in 2050. He previously wrote a book about the history of American cities, but in his new book, The Next Hundred Million: America in 2050, he looks ahead to how recent economic and demographic trends may play out over the next few decades. Here are a few of the book’s most striking predictions. Demographers predict that the nation’s population will soar to 400 million citizens in the next 40 years. For some that signals disaster: global warming, peak oil, social decay and the decline of the American empire. Futurist, columnist and author Joel Kotkin takes a more optimistic view. He envisions America at 2050 as “the most affluent, culturally rich, and successful nation in human history.” Set against ethnic conflicts, low birth rates and increasing homogeneity in the rest of the world, American will defy the naysayers and trends toward urbanization to become a more bountiful, multi-racial society, powered by land, localism, green technology and our defiant indigenous spirit. Joel Kotkin has researched prodigiously on an impressive array of economic and social issues. After all, what aspect of life won’t be affected by such rapid population growth? But it can be frustrating that he doesn’t slow down to drill deeper on some topics. His prognosis is also so optimistic that Kotkin can sound less like a dispassionate journalist and more like a development consultant — which, in fact, he is. Still, Kotkin has a striking ability to envision how global forces will shape daily family life, and his conclusions can be thought-provoking as well as counterintuitive. It’s amazing there isn’t more public discussion about the enormous changes ahead, and reassuring to have this talented thinker on the case. Kotkin (The City) offers a well-researched—and very sunny—forecast for the American economy, arguing that despite its daunting current difficulties, the U.S. will “emerge by midcentury as the most affluent, culturally rich, and successful nation in human history.” Nourished by mass immigration and American society’s “proven adaptability,” the country will reign supreme over an “industrialized world beset by old age, bitter ethnic conflicts, and erratically functioning economic institutions.” Although decreasing social mobility will present a challenge, demographic resources will give the U.S. an edge over its European rivals, which will be constrained by shrinking work forces and rapidly proliferating social welfare commitments. Largely concerned with migration patterns within the U.S., the book also offers a nonpartisan view of America’s strengths, identifying both pro-immigration and strongly capitalist policies as sources of its continued prosperity. However, Kotkin tends to gloss over the looming and incontrovertible challenges facing the country and devotes limited space to the long-term consequences posed by the current recession, the rise of India and China, and the resulting competition over diminishing energy resources. Nevertheless, his confidence is well-supported and is a reassuring balm amid the political and economic turmoil of the moment. Think you have trouble finding a parking space today? Wait until 2050, when the American population will have grown by another 100 million. The cultural shifts are likely to be dislocating to some, though the relentlessly optimistic author believes that the future will see a mix of traditional values and new ones leading to greater social tolerance. Whereas other nations are likely to decline precipitously, he adds, America will truly be in a position of economic dominance—though, admittedly, output might be high because no one will be able to afford to retire, given current trends. Less rosy is Kotkin’s picture of a future America in which the leading cultural centers are likely to be—and elsewhere, to look like—places such as Phoenix, Dallas, Houston, Atlanta and Miami, “multipolar, auto-dependent, and geographically vast.” So much for reversing climate change, even if the author does see the rise of “greenurbia” in years to come. A fascinating glimpse into a crystal ball, rich in implications that are alternately disturbing and exhilarating. It is easy as a blogger whose views may not fit the current political majority (as defined by the last election or two, or the last Congressional vote) to succumb to the belief that things are going from bad to worse. 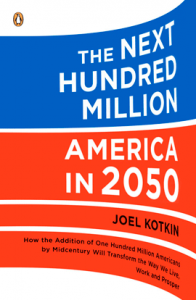 I have, however, found an antidote — a book, Joel Kotkin’s The Next Hundred Million: America in 2050.